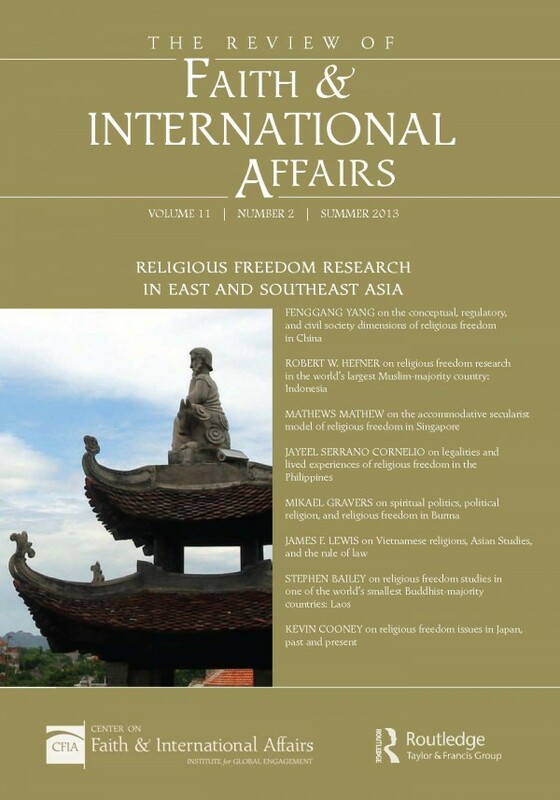 In the Summer 2013 issue of The Review of Faith & International Affairs, experts on eight countries of East/Southeast Asia—China (Fenggang Yang), Indonesia (Robert W. Hefner), Singapore (Mathew Mathews), the Philippines (Jayeel Cornelio), Burma (Mikael Gravers), Vietnam (James F. Lewis), Laos (Stephen Bailey), and Japan (Kevin Cooney) assess the state of existing scholarly research on religious freedom. In most cases they find that serious scholarly research focused directly on religious freedom is a rarity. They offer theories to explain the past patterns of research on religion, and make detailed recommendations for future research projects on religious freedom that would enrich the multi-disciplinary field of Asian Studies.